Hari, Lord Vishnu, took the form of Mohini, and gave Amrit to the Devas after cheating the Asuras out of their share by bewitching them into stupefaction through feminine charms. Hara, Lord Shiva, who had already saved the Devas by drinking the Kalakoota which threatened to deluge them, heard of this, and desired to see the Mohini form of Hari, Mohini appeared in a garden, playing with a ball, and tantalized by her beauty, Hara lost control over himself. Hari Hara Putra, the god born of this episode, manifested in various forms at various times. In Kerala he descended as child Manikantha and grew up to be known as Bhootanatha, Lord of the Elements: Ayyappan, Lord of the Sense; Dharma Sasta, Lord of the Verities. Bhagavan Parashurama installed him on Sabari Hill as the guardian of the land created by him. A pilgrimage to Sabari Hill is a Sadhana of a rare combination of courage, humility and faith. The gamut of its correct observance covers the whole field of physical endurance, mental purity and moral upliftment, culminating in the complete eradication of ego-sense and the consciousness of utter surrender to Him Who Alone Is. THE Bharatiya Vidya Bhavan-that Institute of Indian Culture in Bombay-needed a Book University, a series of books which, if read, would serve the purpose of providing higher education. Particular emphasis, however, was to be put on such literature as revealed the deeper impulsions of India. As a first step, it was decided to bring out in English 100 books, 50 of which were to be taken in hand almost at once. It is our intention to publish the books we select, not only in English, but also in the following Indian languages: Hindi, Bengali, Gujarati, Marathi, Tamil, Telugu, Kannada and Malayalam. This scheme, involving the publication of 900 volumes, requires ample funds and an all-India organisation. The Bhavan is exerting its utmost to supply them. The objectives for which the Bhavan stands are the re- integration of the Indian culture in the light of modern knowledge and to suit our present-day needs and the resusci- tation of its fundamental values in their pristine vigour. We seek the dignity of man, which necessarily implies the creation of social conditions which would allow him freedom to evolve along the lines of his own temperament and capa- cities: we seek the harmony of individual efforts and social relations, not in any makeshift way, but within the frame- work of the Moral Order; we seek the creative art bf life, by the alchemy of which human limitations are progressively transmuted, so that man may become the instrument of God, and is able to see Him in all and all in Him. This common pool of literature, it is hoped, will enable the reader, eastern or western, to understand and appreciate currents of world thought, as also the movements of the mind in India, which, though they flow through different linguistic channels, have a common urge and aspiration. Fittingly, the Book University's first venture is the Mahabharata, summarised by one of the greatest living Indians, C. Rajagopalachari; the second work is on a section of it, the Gita by H. V. Divatia, an eminent jurist and a student of philosophy. Centuries ago, it was proclaimed of the Mahabharata: "What is not in it, is nowhere". After twenty-five centuries, we can use the same words about it. He who knows it not, knows not the heights and depths of the soul; he misses the trials and tragedy and the beauty and grandeur of life. The Mahabharata is not a mere epic; it is a romance, telling the tale of heroic men and women and of some who were divine; it is a whole literature in itself, containing a code of life, a philosophy of social and ethical relations, and speculative thought on human problems that is hard to rival; but, above all, it has for its core the Gita, which is, as the world is beginning to find out, the noblest of scriptures and the grandest of sagas in which the climax is reached in the wondrous Apocalypse in the Eleventh Canto. I thank all those who' have helped to make this new branch of the Bhavan's activity successful. All glory to the Lord Ayyappan, the Son of Hari and Hara, the Indweller and the Inner .Ruler of all hearts, the Timeless and Spaceless Tarak Brahman. My prostrations unto Him. From ancient times the sacred shrine of Lord Ayyappan, situated in the enchanting scenery of the Saban Hills, in the State of Kerala in South India, has been a source of inspiration and centre of faith for innumerable devotees of the Lord. The detailed story of the Lord is not found in the Puranas. Most of the Lilas of the Lord Ayyappan are known to South Indians especially to Keralites. People in North India and those of foreign countries are mostly un- aware of the elevating stories of the Lord, the miracles of His saving Grace and the fervent devotion of His innumer- able devotees. Though the Supreme Lord is One without a second, yet He is worshipped in different shrines, with special emphasis on different aspects of His Divine Nature, and each shrine of the Lord has a special charm, a special influence, a special significance for the devotees. Sri Pyyappanji, the excellent writer of this book, has rendered a great service to mankind by revealing the Lilas of the Lord to a far larger public through the English lan- guage. The story of the Lord' Ayyappan has been told in a most interesting, inspiring and elevating style. Apart from the beauty of literary presentation, every line of the book rings with the note of supreme devotion, unflinching faith, burning aspiration for God-realisation and utter dedication and renunciation. There is unique sweetness and indescrib- able charm ,in the story of the Lord. 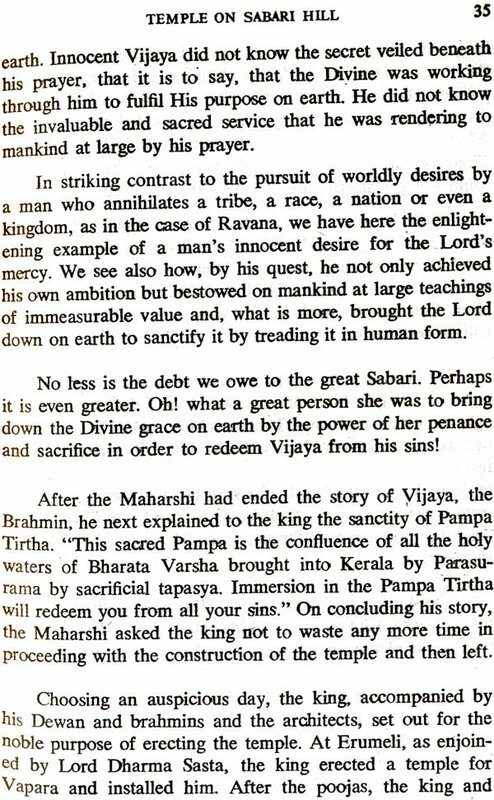 The author beautifully describes how the Lord was found as a babe by king Rajasekhara on the banks of the river Pampa, how the babe, Manikantha, was brought up by the king and queen who were childless, how Manikantha bestow- ed the power of speaking and hearing upon the deaf 'and dumb son of his 'teacher in the form of Guru-Dakshina, how He had to obtain the milk of a leopard owing to a scheme of the jealous queen to put an end to his life, how He destroyed the demoness Mahishi, how He bestowed Immortality upon Vie king, and various other anecdotes connected with the- advent of the Lord. The author has written an inspiring chapter on the eso- teric significance of pilgrimage and the methods of the wor- ship of the Lord Ayyappan. The austerities such as Brahma- chary a, seftess service, Satwic food, etc., have been described as a preparation to the pilgrimage to the sacred shrine of the Lord. Life. verily, is a pilgrimage of the soul to the Supreme . Lord or Paramatrnan, through the successive steps of Yoga and devotion, The external pilgrimage is the outer mode of the inner process. When the pilgrim has intense faith and devotion, his every step towards the shrine removes the inner obstacles from the inward path and draws his soul nearer and nearer to the Blessed Abode of the Lord. Various me- thods of worship, such as carrying a coconut filled with ghee, have spiritual significance and the knowledge of them is highly beneficial for satisfying intellectual curiosity on the path. The soul wanders in this world due to its attachments to the material sheaths. One should purify one's heart by the practice of austerity, worship and devotion to the Lord in order to obtain Divine Grace. It is Divine Grace that sweeps away all the impurities of the heart, breaks all the fetters of attachment and takes the soul to the Infinite Abode of Im- mortality on the shining 'wings of faith and aspiration. This is the essence of the teachings of the Lord. The book is replete with general instructions on spiritual Sadhana. The enchanting power of desire and its baneful consequences have been amply illustrated. Jealousy, anger, impurity and other vicious emotions of the heart must be controlled and eradicated for the attainment of true devotion to God. Without doubt the book is an exquisite piece of Bhakti literature. Its daily Swadhyaya is very auspicious. It is an inspiring book for all. I hope the devotees of the Lord will find a rare treasure in this beautiful work. May the Lord bless the author with long life, peace, prosperity, success in all undertakings, Immortality and Eternal Bliss. May the blessings of the Lord Ayyappan be upon us all. what is the vehicle of the ayyappan?